I design "old school" (hand-drawn parts) but with new school technology. Seriously. I design things in my head. I picture the model...break it into components and smaller structures. I imagine how it might unfold or assemble (in my mind). Then I start drawing 2D parts in Coreldraw. I work solely in CorelDraw. I use a lot of math and measures to correct the drawings. Eventually I print a part and test build it. If it doesn't work, I adjust it, modify it or completely redesign it. Sometimes I add the colours, and surface details as I design. But sometimes I just "white build". but other than that I don't use any 3D software. Wow.... that's amazing. Looking forward to see the finished product. WIPs: BAe 146-200 Eurowings, Williams FW14B "Red 5"
Dave, doing this range is a great idea. Accessories for diecast model aircraft, for which there a huge number of collectors, are either hard to get or very expensive due to the fact they are resin etc. The common scales are 1/200 and 1/400. So if you plan for these scales and maybe use a Minibox approach regarding the wheels (as most collectors are often not skilled modellers) you could well have a winner in terms of potential sales! Vehicles - tugs, pushback handlers, small tractors for dollies and trollies, de-icing vehicles, washing vehicles, baggage handlers, dollies for luggage and aircraft pallets, catering trucks, refuelers, security vehicles, small vans, airport fire engines, passengers buses, portable stairs (still used in the 3rd world and small airports), aircraft service stairs, ground power units, container loading trucks, belt loading trucks, catering trucks, air start units, toilet service vehicles, air start units, transporter and loading platforms and water trucks are all the common ground support vehicles seen! So, there is tons of scope! okay, this is a hugely important comment! I like hearing that my efforts are not wasted. Its funny, because I have a co-conspirator in this project...someone who pushed me to get started on it. And someone who has some build skills and will help me test building everything. And that person has already asked for more detailed wheels...3D wheels. (I assumed that the smaller scale design could be reduced to 1/200, 1/400 a lot easier). But even at the 1/100 level, I felt that 3D wheels were still too small. I know this first model, the larger Pushback Tractor, has much bigger wheels. At 1/100 they are about 15mm in diameter...and can be assembled from 4 parts. But shrink them down to 1/144...and the wheels are close to half that size! And what about smaller wheels on smaller vehicles and equipment?! My next, smaller Pushback model has 10mm diameter wheels. Still buildable at 1/100, but getting real tough at smaller scale. A Baggage Train has very small wheels that will end up at 3 or 4mm diameter. Absolutely impossible to build for me. And so, I have to temper my amount of detail, and control how complicated the designs are. If I put too much into this larger Pushback Tug, then I am obligated to put the same into subsequent equipment. So thats why I went with flat 2D Wheels and Tires, even on the largest model. beginners and more advanced builders. I am working on a second modern style Pushback. A slightly smaller vehicle, with smaller Tires. And I am attempting to incorporate 3D wheels. I'll give it a try...see what I think...and decide if I want to redeign the larger Tractor with 3D wheels. But I am wondering if the flat 2D wheel approach is what I should stick with? And before you say "why not include both?" Keep in mind, I have to design and fit two completely different "chassis" (for two different wheel options). but the time spent on each model design is a major concern. A kit with 30, 40, 50 models in it...will take me years to complete! I will go look up this "minibox" approach.? On small wheels on cars and trucks, etc., I generally do a layered approach. I make a copy of the wheel opening with excess wheel well around it. I then cut the wheel off the original model and cut out the wheel well. I glue the new part behind the wheel well opening and the wheel on top of that wheel. Gives depth without being too fiddly. On baggage carts, wheels are below the chassis, but a layered wheel might work on that, too. To supplement Vermin King's post, here are pics showing your original carrier-tug at 1/50 and the reduced scales of 1/100 and 1/144 proving that they are buildable with that much details. I'm not here to brag about my small scale build skills but just try to convince you that you should design the airport vehicles at your usual scale of 1/50. Leave it to us to downscale to whatever we (small scale builders) want while your kit(s) can still cater to the needs of the normal to medium scale builders who may want them at 1/33 or 1/72. You don't have to include everything in one kit, but spread them out and make more dough from them. Look at the volume of airliners being designed and distributed free or paid and the number of interested modelers presenting them at this or other forums. I bet many of us are looking for supporting vehicles and equipment to make diorama of civilian aviation. Think how lucrative it is to be the provider of these models. There isn't too many (if none) on the market that can be purchased or obtained. The European modeling community have a few but without instructions and are actually puzzles to us, so they don't generate a growing interest for us to get them. Just an illustration of PR Models and R&P Models, they design mainly at 1/250 among other scales and the vehicles have only graphics wheels. Not too good at 1/100, right. Minimodels are all 1/100 and they have 3-D wheels. So why worry about their not being buildable? You can actually modify your kits instead of starting from scratch. If you talk about pricing, your latest design, the Saladin, is great and a work of art to the enthusiast but is priced at the same as the Airfield Diorama kits. Considering the time and amount of work you invested in it, it's not proportionate to the money you ask for each kit. Of course if you set the price too high, there'll be little of no sale at all. We don't expect you to give very high details of the airport vehicles and equipment so the time frame to do them one by one, from simple to complex, shouldn't be as long as the Saladin. Hope you don't mind my being long-winded but I just want to say what I want to say about this whole thing. There is a difference between "being buildable"
and whether people will want to...try to...can... build it. First off, I have no interest in any scale larger than 1/72 for these models. if I wanted to design something to be built at 1/32 scale, I would take an entirely different approach. It would also be a stand alone model, as opposed to "accessories" for diorama. These are accessory pieces with a much simpler design approach. ...and focusing on the visual effect, rather than the complexity of the models. I would not attempt to build the 1/50 scale Tugs at 1/144. Even 1/100 would be difficult and frustrating for me. Maybe not for you...but it would be for me. And many other beginner to intermediate builders would be intimidated by this. And "beginners/intermediate" is my target audience. Along with the average Jet Airliner builder (who may not want to spend as much time on the accessories). As I said, for the larger Tugs, and vehicles with larger wheels, I will consider basic 3D wheels. I might add this option, along with 2D wheels, but only for certain models. Its not that easy to just "modify" the model for a change like this. Sometimes I design a body around a certain style of chassis. It may not be easily modifiable, and might require a more extensive redesign to accept the changes. Its sometimes easier to go back and start from scratch. The minibox model approach is very straightforward. The models are very boxy, with 2D wheels that are literally "boxed in". The small scale allows for this, and the visual effect is quite acceptable. Imagine the models tucked away within a large railroad layout.. I think the point is a very quick and simple model...not just for paper modellers. But... for someone who wants a bit more complex model, this style may not satisfy. and simplicity, ease of build, and less parts. And as always I try to design "for the beginner"...not the skilled modeller. I have to keep that in mind. On a related note...papermate...I noticed a problem with the older Aircraft Carrier Tugs. 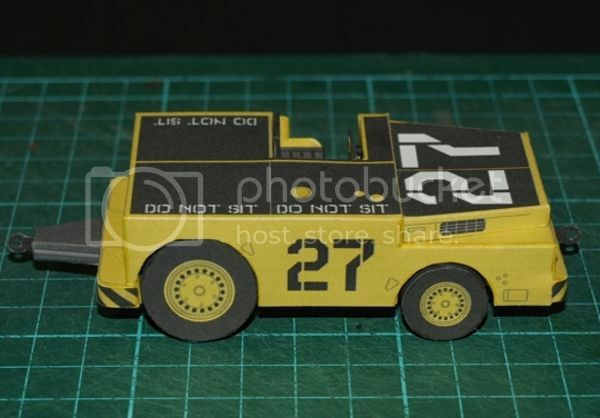 have issues with the numbers and stencilled letters on the top, Engine cover, and vehicle sides. Its the wrong font styles! And as a result, the numbers don't fit properly. Fonts were NOT converted to curves. This is necessary to avoid actual font replacement. As a result, the PDF swapped out the font style for something that isn't correct. Anyway, I have just updated the files. New PDFs have been created and uploaded to ecardmodels. Some interesting thoughts there Dave. 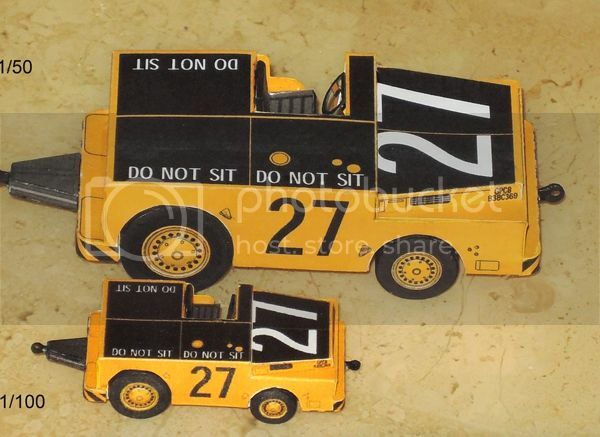 To get an idea of the potential market for diecast collectors, google 1/200 and 1/400 diecast aircraft. And chat to your local aviation type hobby shop. In terms of wheels, as you indicate, building 3d wheels to 1/400 (or worse 1/500, the other diecast scale) would be impossible for most collectors, and hard at 1/200. And in terms of the numbers and size for trollies for baggage and containers - gulp! Some time back for the local market here I designed and made some basic paper model airport structures along with some minibox type tugs and baggage handlers at a reasonable price. Sold the bagged sheets (before the days of internet downloading) and they went like hot cakes, even though, and this is the point, the local market is very small. Last edited by Kevin WS; 05-06-2017 at 01:57 PM. separate tabs are not required. The build steps are for your reference only. Are you going to try @ 1/400 or 500?